Over 99% of Telemarketers Approved! Telemarketing bonds guarantee that telemarketers, or phone solicitors, comply with federal and state regulations governing this industry. While phone solicitation is an excellent way to reach new customers, the telemarketing industry has established various regulations to prevent abuse. This surety bond protects consumers from violations and other fraudulent telemarketing practices. We have a variety of programs designed to get all telemarketers approved at excellent rates, in all 50 states. 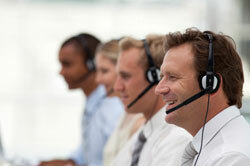 How much does a Telemarketing Bond cost? Can I get a Telemarketing Bond if I have bad credit? How long does it take to get a Telemarketing Bond? What is the National “Do Not Call Registry”? Annual premium amounts are determined based on owner personal credit. Applicants with stellar credit may be eligible for standard market rates, which range from 1% to 3% of the bond amount. If the owner has a low credit score, or past due items on their credit report, annual premium typically ranges between 5% to 15% of the bond amount. Yes. While many sureties only offer quotes to customers with stellar credit, Lance Surety has a variety of telemarketing bond programs that allows us to approve over 99% of applicants instantly through our online application. Your annual premium will depend on the business owner’s credit profile. You can get approved for a telemarketing bond in just minutes by completing our online application. Once you receive a quote, pay the premium and send in a signed copy of the agreement, we can get started on your bond right away. Typical turnaround time is with 24 to 48 hours. This is a list of phone numbers managed by the Federal Trade Commission (FTC), covering interstate telemarketing calls. It consists of consumers that have indicated their preference to limit the amount and type of telemarketing phone calls they receive. Certain exemptions apply, such as charities. The Do Not Call Registry can be accessed at www.telemarketing.donotcall.gov. Yes, an improved credit score can help to lower your renewal rate, but it does not guarantee that the price will be lower. In addition to FICO score, renewal premiums will also depend on collections and public records on your credit report, and updated surety underwriting guidelines for your specific bond type. For larger bonds, surety underwriters may require updated business financials in order to offer renewal terms.